When at conferences, the prospect of finding good coffee even moderately close by is low. But nonetheless, I have to search (it's in my blood). Traveling the city of Portsmouth didn't offer much hope as I had received no recommendations amidst the beautiful city, but I still clung to hope. Finally, I ended up settling on a cozy-looking place called Port City Coffee Roasters located in a shopping center a little off my beaten path. Strolling in, the cafe struck me as a basic place and somewhat deli-esque in feel (flourescent lights, not much seating, etc). I ordered their Bed and Breakfast blend, a smooth medium roast with the flavor of Ovaltine and in totality, not a bad cup. The espresso was pulled long (almost a tiny americano), served in a paper cup and possessed little else besides a milkshake-ish head and a bitter bite. The tea is Tazo. 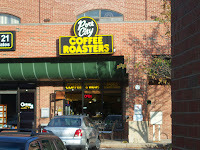 Getting out into Portsmouth proved nice but Port City Coffee Roasters did not add as much to the trip as I had hoped. If you're looking for a fair coffee in Portsmouth, stop by Port City. I'm kind of surprised you didn't have a better experience. I've order online from them and really liked their Indian Monsoon Malabar and Chocolate Mudslide. Tis the challenge of evaluating a coffeehouse on a small amount of experience. 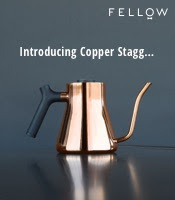 Their coffee roasting seemed to be their strength, so I would imagine that some of their coffees are fairly good (mine was decent just not earth shattering), especially given the nature of Monsoon Malabar (a fairly consistently good coffee regardless, usually, of roaster). But accolades to places I don't love are exactly the reason that I leave all reviews open to updates. Bill...if you feel roasting is their strength, then what are your thoughts about the company in Maine that does most of their roasting? How do you feel about PCR's deceptive strength now? Their roaster is primarily for looks and aesthetics. Bill, get a clue! This place is not worth the effort to get out of a car and walk in! As to whether Port City roasts or not, I only know what they told me at the cafe and what their website repeats in many places (i.e. that they roast their own coffee). To say that their coffee comes from a Maine roaster is news to me and I would be interested in seeing such data. As for Monsoon Malabar, while it's not a common coffee as of late, I would venture that it is inched out by the great number of amazing coffees available for far less (similar situation to Kona and Jamaican Blue). But despite that, I wouldn't rule it as an inferior coffee; just one that isn't as sought out. Overall, thanks for the thoughts! Like I said, I only encountered Port City briefly and it's good to get perspective. Thanks for reading and the recommendations! At least it is good to see that others are finding the same :). I just found your blog. 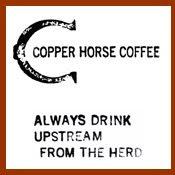 I have been using their Espresso blend at home with good results. Not sure about the comment about roasting being done in Maine as I have been overwhelmed by roasting coffee aromas in the neighborhood round them and they are the only roasters around! I do think roasting coffee is their strength...not making coffee. Try Caffe Kilim or Maison Navarre for a good cup on your next visit to Portsmouth.